1- Nemanja Matic Is The One To Drop Into Back Four if Manchester United Need To Throw Kitchen Sink. Red Devils boss Jose Mourinho’s all or nothing modus operandi paid off handsomely when his decision to revert to one recognised central defender – Chris Smalling – helped precipitate a late revival that saw United claw back from 0-2 down to beat Newcastle United in a Premier League cracker. A week earlier at West Ham, Man United floundered to a 1-3 loss with Scott McTominay part of a back three. Lesson learned: If Unitéd need to turn on the afterburners, Matic, not McTominay, should be the player to drop into central defense. Matic has the know-how and bags of experience. McTominay is still learning his bearings. 2- Managers instructions ought to be detailed. Champions Manchester City lost a glorious chance to steal the march on rivals Liverpool when Riyad Mahrez ballooned a penalty into the skies in the dying embers of their matchup. The sight of record signing Mahrez jostling with Gabriel Jesus for rights to take the spot kick is not one you would associate with a Pep Guardiola coached team. Why the world’s most decorated club manager chose a player who has missed five of his last eight spot kicks, only he can tell. Top teams are supposed to have a penalty taking pecking order. For example, Chelsea’s Italian midfield conductor Jorginho has an impeccable record from the spot. But he can never challenge Eden Hazard for the right to take a spot kick. 3- If You Want A Loan Signing, Go To Barcelona Or Real Madrid. Teams that sign players from the two Spanish giants almost always get it right. This is because as the world’s premier clubs, Blagruana and Los Blancos scour the globe for pure, unadulterated talent. Just like Juventus which milked an Alvaro Morata spell and Bayern Munich who are benefiting from a James Rodriguez loan; Borussia Dortmund are reaping massive rewards for getting Achraf Hakimi and Barça’s Paco Alcacer. The latter’s six goals in 81 minutes of Bundesliga action make him the unofficial world’s most dangerous substitute. I would be surprised if Lucien Favre doesn’t make him a permanent signing. 4- Dortmund Have Defensive Issues To Sort Out. On Saturday, Borussia Dortmund opened up a three-point advantage over the Bundesliga chasing pack with a pulsating 4-3 victory over Augsburg. However, their victory masked a woeful defensive display in which the Bavarian visitors won virtually every aerial ball floated into the Dortmund 18-yard box. I had also noticed Monaco win possession high up in pitch in their Champions League loss to Dortmund. If they are to ward off a Bayern Munich fightback after the international break, Lucien Favre’s side must spend time working on the defensive side of the game. 5- Paris Saint Germain Could Score 200 Goals. 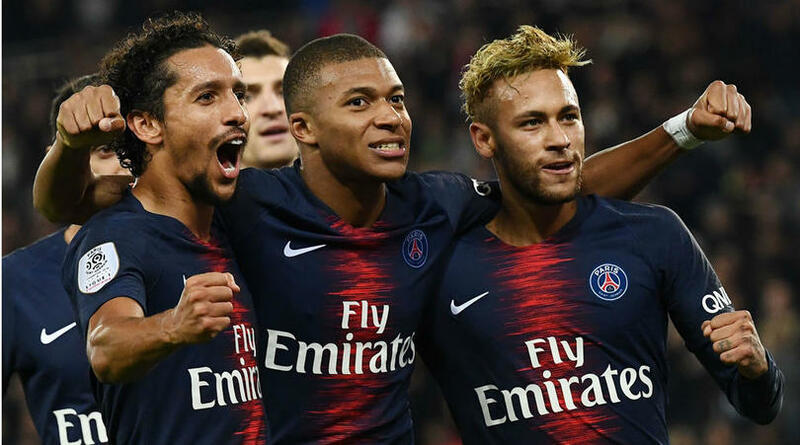 If French champions Paris Saint Germain continue in their current vein of form, they could become the first club in football history to score two hundred goals in one season. Thomas Tuchel’s Parisians have already netted 32 league goals in nine French Ligue One outings. A further nine goals in two Champions League outings puts their average number of goals per game perilously close to four. We all know that a team of PSG’s magnitude plays over sixty games each season. Even if their average was to peter off to three per game, 200 goals would be within reach. Barring injury Neymar, Kylian Mbappe and Edinson Cavani are all primed to each score 35+ goals this season. Make a wager on that.